Chief Evangelist: that’s a very different title for me. She has a point. On the other hand, I’m excited by the opportunity to engage directly in an industry I previously covered from the outside. A large part of my role will be to research practical success stories and tips on best practices to share with you. (If you would like to share your thoughts, please write me at david@redbooth.com). I may no longer be an “objective” journalist when it comes to Redbooth, but I am still a researcher and a storyteller. A big part of my job in the coming months will be to talk with as many customers as possible, find out what Redbooth is doing for their organizations, and learn what we can do to serve their needs even better. Many of those conversations will be “off the record,” in the lingo of my old job, but in my new role publishing the stories isn’t the most important thing. What’s important is recognizing success and encouraging more of it. I have been researching and writing about business use of the web since the mid-1990s, when I was Technology Editor at Internet World Magazine. InformationWeek originally hired me to edit an online publication about social business and collaboration technologies (known at one point as The BrainYard), which served as the editorial companion to the Enterprise 2.0 conference series. I served as E2’s social business track chair, developed the E2 Social Business Leaders awards program, and eventually summed up a lot of what I learned in a book, Social Collaboration for Dummies. I had written about Redbooth (under its old name, Teambox) as one of the solutions that emphasized organizing teams and getting work done over purely social collaboration. Later, I did a feature on Redbooth’s adoption in higher education, and noted the expansion of the product to include chat and videoconferencing. Because the Dummies book was about a category of products rather than any one in particular, I focused on patterns of best practices as well as pitfalls to avoid that apply to many collaboration tools. One of the emerging trends I covered was the rise of tools focused on getting work done (rather than merely talking about it), which is exactly where Redbooth fits. Part of the point of the For Dummies series is to start from the basics, so the book begins by explaining what social networking is, why helping people form connections online is so powerful, and how the same principles can be applied to form more cohesive and effective organizations. Because social collaboration can be applied in many different ways — for corporate communication, content management, knowledge management, and team productivity — I found myself addressing chapters to the CEO, CIO, director of sales, project manager and individual worker bee, each of whom has a role to play and each of whom can learn to exploit the collaboration environment more effectively. Some of the new collaboration environments are more “social” than others but all of them are chasing the same idea of frictionless interaction. Training is accelerated by familiarity, at least for those employees who use social networks in their personal lives. At the same time, work is different from play, and people still need to learn to be productive in an online workspace. The truth is technology is never the whole answer in any story of success or failure. Don’t get me wrong: I’m impressed by how hard the Redbooth product team works to maximize your chances of success. But how you use the product is equally important. No organization becomes more productive, collaborative, or networked just by licensing a software product or signing up for a cloud service. Regardless of your choice, leaders still have to lead and teams still have to execute the work. That is why the members of Redbooth’s customer success team, who I had the pleasure to meet recently, are an important part of our efforts to learn what makes customers successful with the product so we can make more customers more successful (and more likely to remain customers for the long term). One recurring theme is that the success stories tend to include a leader who decides to put the software to work on a practical project where use of the tool is not optional but central to the way work will be done. That first project may be a pilot project, but it’s something real that proves the value and paves the way for expanded use. In contrast, the organizations that merely dabble with collaboration in Redbooth or make it available to the organization without guidance on how it should be used – well, they face longer odds. This is consistent with what I learned during the research for my book: that you can sabotage yourself with a pilot project that is too tentative. For team members to see the practical value of Redbooth requires applying it to real, practical work that needs to get done. We want more customers to follow the most productive patterns because making you more productive is our whole mission. We know that if we can help make you and your team dramatically more productive, you will be the best evangelists of all. 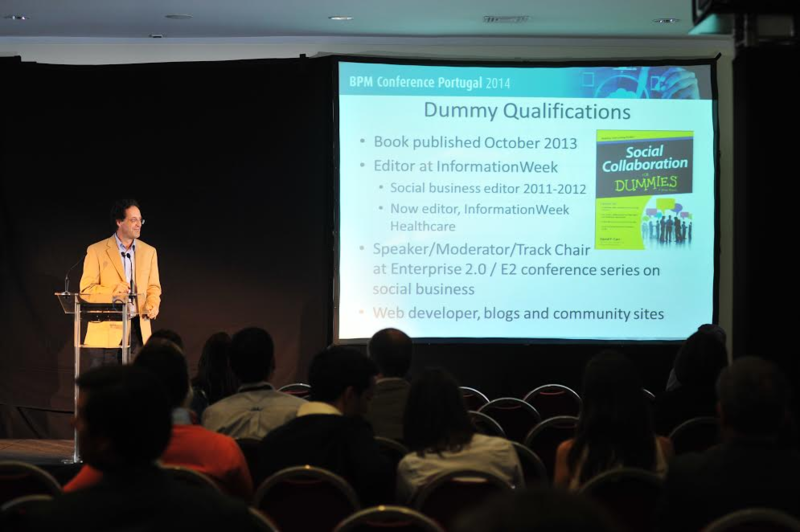 Photo: David F. Carr speaks about Social Collaboration for Dummies at BPM Conference Portugal 2014.